You can promote good nail health right at home by filing your nails to keep them healthy. You can have shapely and strong nails by using the correct nail file, choosing a good shape for your nails, and filing in the correct positions and directions. Before you file your nails, you should thoroughly wash your hands with soap and water to get rid of any film or oil that will disrupt your filing. Make sure your hands and nails are dry before you begin. Liquid can dehydrate nails and make them more prone to breaking while filing. While there are several types of nail files you can choose, emery boards are both affordable and effective. Choose one with a high grit to get the smoothest finish, around 300-600 grit. Coarse grits, around 80-100 grit, should only be used with acrylic nails. If you use them with natural nails, they will tear up your nails. Avoid metal files as they can also tear up your natural nails. Glass, or crystal, files are very effective and can be easily cleaned in the dishwasher. There are many nail shapes to choose from, but the most basic shapes are oval, square, and almond. Deciding what shape you want will depend on what your preference is and what kind of nails you have. Oval-shaped nails are a great shape for growing out and maintaining your nails. It’s the most functional since your nails will be least likely to break off in this shape. Oval-shaped nails are symmetrically round at the tip. Square-shaped nails are a great statement and work well with people who have long nails. The square shape comes from filing the nail straight at the tip all the way across the nail. Almond-shaped nails are great for making your fingers look more slender. The shape mimics the curve at the base of your nail. Have short nails that can’t be shaped? It’s no big deal. Use what you’ve got to work with and apply cuticle oil to them every night to help them grow for future shaping. If your nails are on the longer side, cut them down taking into consideration the nail shape you want. If, for example, you want square-shaped nails, you shouldn’t cut your nails much, if at all, since square-shaped nails require longer fingernails. You can cut your nails a little shorter if you desire an oval-shaped nail. However, be sure to cut your nails in that oval shape. If you’re aiming for almond-shaped nails, cut down the sides of your nails more than the tip. 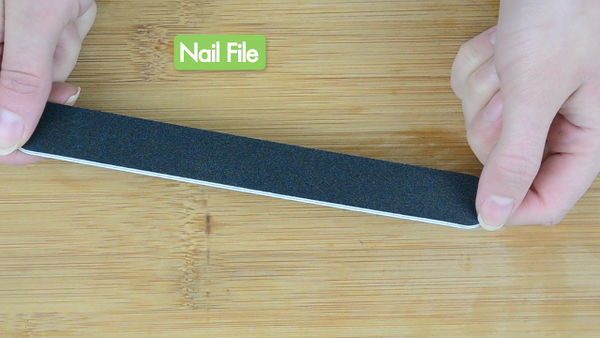 Hold the file parallel to the side of the nail when beginning your filing. This will prevent breakage. Be sure to not file too far into the side of your nail. If you do, this can make your nails more susceptible to breakage. It’s important to file your nail from the side to the center in one direction using a fluid motion. 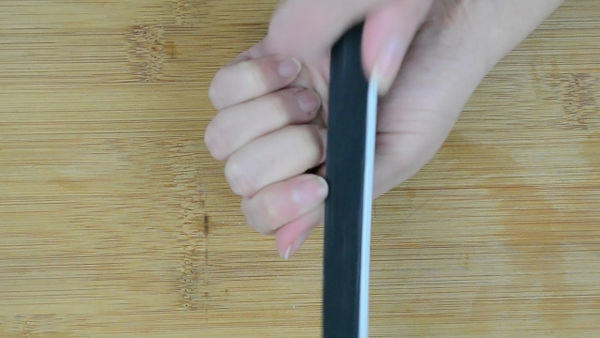 This will ensure that your nail is smooth, and not jagged. You should never “saw” your nails back and forth with a nail file. This will cause peeling and breakage of the nail. When filing your nails from the side to the center, you should always hold the nail file perpendicular to the tip of the nail. This will prevent weakening the nail while filing. Filing at an angle from above can cause the nails to thin. If your nails are already thin, hold the nail file flat to your nail, tilting it to file from slightly underneath your nail. Move the file from its perpendicular position at the tip of the nail to the opposite side of the nail from which you began. 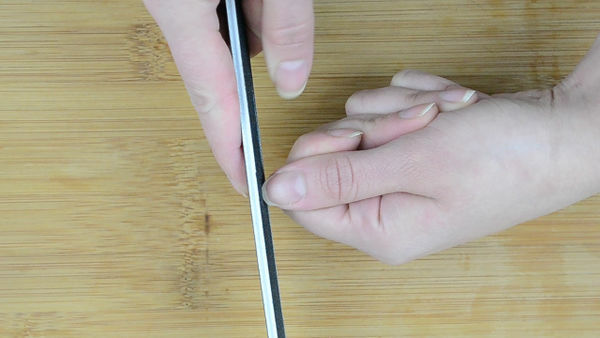 Make sure that you hold the file parallel to the side of the nail. Since you should never “saw” your nails back and forth, lift the file away from your nail and return to the side of the nail for another pass. If you’ve got some nail filings still attached to your nails, remove them by placing the tip of the file underneath your nails and flicking upwards. Give your nails a shine by buffing them after you finish filing. This will help show off your newly shaped nails! You can purchase a buffer at any beauty supply store. Regularly apply cuticle oil to your nails and keep your hands moisturized to ensure healthy nails. Everytime you wash your hands, you should apply cuticle oil and moisturizer. Keep cuticle oil and moisturizer next to the soap at your sink as a reminder to apply regularly. Only file your nails once every two to four weeks. Filing your nails too frequently can damage them as they won’t have time to grow properly.